Excellence is a habit acquired through hard work, and nothing comes harder than Peace. This time last year, our Sixth Form Drama company reinvented themselves as the ‘Claires Court Shed Theatre’ and were in the final stages of rehearsal prior to taking their stage production of Michael Morpurgo’s novel, ‘The Kites are Flying’ to the Edinburgh Fringe. It is a story of our times, told across the wall that divides the Israeli and Palestinian communities, woven with tragedy yet still offering hope through the eyes of innocent youth. You can see the Facebook site for our production here. The work was quite extraordinarily moving, won much critical acclaim from those that saw it both in Maidenhead and in Edinburgh. By all measures, the work exemplified ‘Excellence’. No Edinburgh Fringe this year, as the company are working on a longer term plan of ours to recognise the centenary of the outbreak of the Great War, by performing “Oh What A Lovely War”, a stage play devised by Joan Littlewood and first performed by her Stratford East Theatre Workshop in 1963. I quote from the Director’s notes: “Oh What A Lovely War is a theatrical chronicle of the horrors of the First World War told through the songs and documents of the period. The story is told through the device of a Pierrot show, in the form of vaudeville/ Music Hall where a series of sketches are interspersed with songs and dances. It can also be seen as a political documentary using projections of historical events and facts and figures about the war. The play embraces comedy, dance, satire, pathos, realism and songs of the First World War. It is a supreme example of Total Theatre; much of it is funny, much of it is carefree, yet behind the action we see the facts and realities of the losses incurred. The show comes over as a tribute to the men in the trenches but is also an assault on the top brass and those who grew fat on the profits of war. Claires Court has performed this production previously, shortly after the opening of the Senior Boys Sports Hall in 1984, to commemorate the 70th anniversary. At that time, there were still many combatants alive to speak anew of their experiences of battle, in the trenches and of their lost comrades. In 2014, all the participants have gone, and on that ‘death of the authors’, are we any the wiser as citizens, nationals or protagonists? What you can bet your Lee Enfield on is that the cast (the core drawn from the Sixth Form) is that they will practice and rehearse such that the production is genuinely brought to life as intended – not as a commemoration of war but as a recognition of humanity’s individual bravery and collective stupidity. At the time of writing, the Israeli Army is intent upon the destruction of Hamas’ military might through invasion of the Gaza Strip, the West and Russia are posturing over the catastrophic destruction of MH19 over Eastern Ukraine, one of many countries across the world rife with civil war. It seems that none of the great nations are able to bring peace and security, not even the ultimate super power, the United States. Over the last 100 years, we have learned but one thing; it is easier to win the war than it is to win the peace. What I know is that through our own choice of dramatic theme for the Autumn term, through the dint of hard work and a passion to achieve excellence, we will win some younger hearts and minds to work more actively towards the ‘peace’ we all want, but that which my generation, born and bred in the Fifties and Sixties, spoke and sang so much about, but at which in the end were unable to work hard enough for the World’s future generations to enjoy. This entry was posted in Uncategorized and tagged Claires Court Shed Theatre, Edinburgh, Edinburgh Fringe, Oh What A Lovely War, Theatre Royal Stratford East. Bookmark the permalink. 3 Responses to Excellence is a habit acquired through hard work, and nothing comes harder than Peace. Some of us are still imagining…. 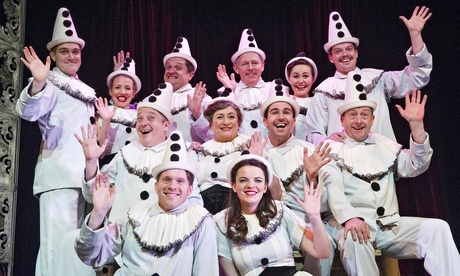 Americans know how to do drama education Mr W. Check this out Happy from Glee Club! I had a pretty glum day asserting that I need better fatigue drugs and walking with the NHS. Came home, having been waiting for an appointment since December and no further forward, watched this and felt like I was walking on air……. The next generation pops up -more colourful and energised than the last- their capacity to create and push boundaries takes us all into a journey into the future. If you enjoyed Ed. Festival why don’t you and Jenny go for the weekend to get the vibe? You could reflect on a Horrible History -style show at the festival next year – maybe a science based one to use your extensive knowledge? If you have been to Epcot there is a wonderful journey through education in “the ball” which maybe a starting point to inspire some Wilding collaborative devised work. Maybe even perform yourselves? What an exciting and dynamic way to take Claires Court to the next level. Performing arts has a real spiritual and physical importance. That is not to say performing arts is frivolous several ex- Claires Court boys have contacted me to telling me they are doing well with public speaking on their law degrees! Apologies for my rapid exit but I needed to stretch my wings for a bit. Epic Battles of History caught my interest recently. This is one Hawking V Einstein. I am not sure how comfortably they sit in the education system but they certainly would be a hit with year 11-13 boys (and some girls ). July this year, McCartney aged 72 still vibing.